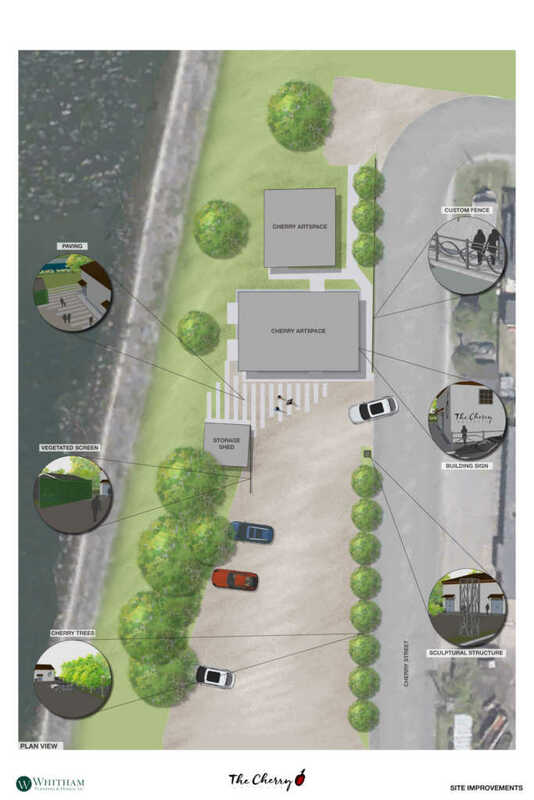 The Cherry Artspace is delighted to announce plans to enhance the Artspace arrival and parking experience and to improve its visibility from the street. With the addition of structural elements that double as works of public sculpture, an additional exterior sign, new plaza paving at the building entrance, aesthetic screening of the storage shed, a regraded parking lot, and additional cherry trees along Cherry Street, the site will prominently celebrate the creative energy and spirit of the Cherry Artspace. 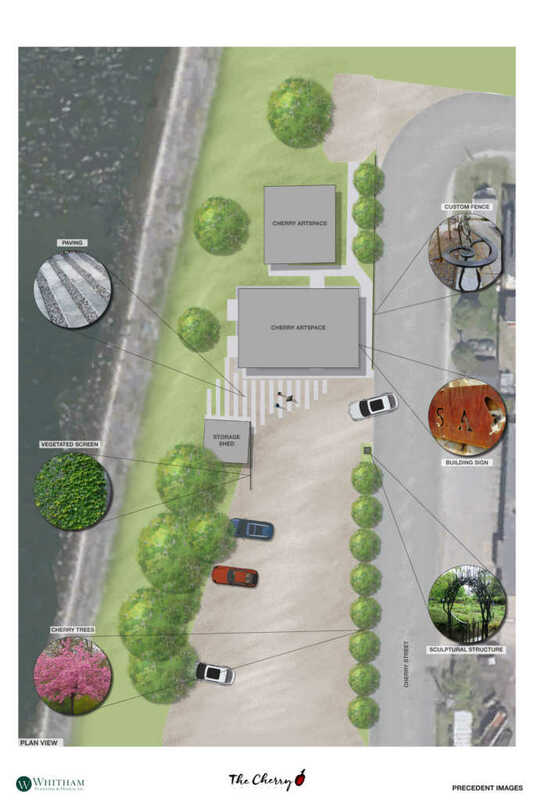 The local landscape architecture firm Whitham Planning & Design, based in downtown Ithaca, has donated their time to design a new site plan and help us put together this vision for growing more fully into our space. Structural/ sculptural elements: The combination of a new custom fence in front of the two buildings and a new custom ‘tower’ sculpture will establish a gateway into the site from Cherry Street. The fence will enhance a feeling of safety for visitors on the existing sidewalk, and the tower will be visible from far down Cherry Street. Both of these will be custom designed metalwork, inspired by the form of cherry tree branches, and will double as works of public art. Additional exterior sign: To complement the existing plasma-cut Cherry logo on the exterior of the building, a new sign that reads “The Cherry Artspace” will be installed on the corner of the building facing Cherry Street. New plaza paving: The entrance to the building will be enhanced with new concrete paving that will integrate the existing sidewalk with the gravel parking area and lawn. This will become an attractive entrance plaza into the Artspace. Shed screening: New metal screens will be added to screen the storage shed and will be planted with vines to grow up and into the screens. This will screen views of the existing refuse area and will better frame the entrance into the Artspace building. The shed will be repainted and a new step will be added that will make moving materials into and out of the shed easier. Regraded parking lot: The existing gravel parking area will be regraded to be flatter and more even so that large puddles no longer form. New cherry trees: To continue the gesture of cherry trees on Cherry Street, an additional row of cherry trees will be added in front of the parking area. We are currently working with Whitham Planning & Design to arrive at a total project cost estimate and will announce fundraising opportunities as soon as they are available.